Anything with mint is a winner for me and this jelly sauce is no exception. The combination of apple and mint gives the bitter sweet taste , you can use with roast pork and lamb, an ideal compliment for your Sunday dinner. 8 small apples (granny smith are good especially apples with pinkish skin for colour), 450g sugar, 2 tablespoons liquid pectin, 30g fresh mint (roughly chopped), 1 juice of lemon. First quarter the apples and add to a large saucepan, fill the pan with enough water to cover the apples and add the mint and lemon juice. Bring this mixture to the boil and then simmer for 20-30 minutes. Take off the heat and cool. After, drain the liquid from the apples and set aside. With a potato masher lightly mash the apple mint mixture and pour the puree into a sieve over a large bowl. With the back of a spoon push and mush the apple in the sieve to extract the juice and fine pulp, be patient you will find after a while you will have got quite a lot out of the mixture. Once you have extracted as much as you can discard the mush left overs, and take the strained juice/pulp and pour into a measuring jug and then top up with the cooking juice, to 1 pint. Take the 1 pint of mixture and add to a clean saucepan and mix in the sugar. On a low heat stir until all the sugar has dissolved, now add the pectin. Turn up the heat and rapidly boil the mixture for 15mins, once the jelly has done it should have reached the temperature of 105C. 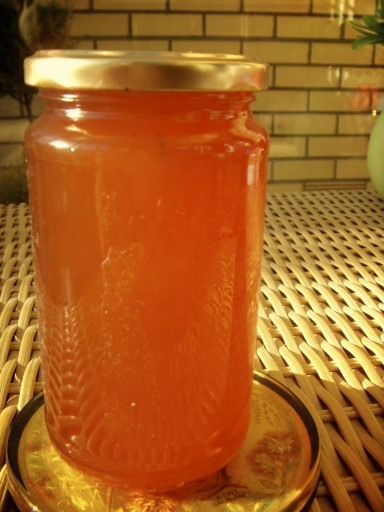 Take off the heat and pour into a recycled sterilised jar, seal straight away, cool at room temperature and then chill. Do not worry if your mixture is liquidly when you add it to the jar because as it cools it will set. A nice simple and sweet recipe for everyone’s favourite jam. I remember eating lemon curd at my Great Grandparents after school when I was young. My granddad would watch horse racing and smoke his pipe while my Nana made me jam sandwiches, tea and a bourbon biscuit. This recipe makes one jar (2 lemons a jar, I would say). 2 Lemons (rind and juice), 2 whole eggs, 2 egg yolks, 150g preserve sugar, 100g unsalted butter. First whisk the eggs and sugar until combined. Melt the butter in a saucepan, add the egg mixture and the lemon juice and rind. On a low heat, keep stirring the yellow sweetness until thick, take off the heat and cool. Put the mixture in a nice sterilised recycled jar, store in the refrigerator. You could also try the recipe with limes, cranberries or tangerines for delectable variety. Simple and Sweet, Lemon Curd-tastic. There is nothing better at christmas time than having a late supper of cold cut meats, a selection of cheeses and pickled onions and eggs! As I was in Korea last year I did miss out on the little delights of a classic british christmas so this year I will be getting my seasonal food treats. What better way right now is to prepare the onions and eggs for pickling, its nice and easy and taste so much better than shop bought. Pickled Eggs: What You needs: A Jar (sterilised), Pickling vinegar (or cidar vingar), 12 eggs, 50g Fresh Ginger (peeled), 2tsp Dried Crushed Chillies,2 cinnamon sticks, 2tsp Black Peppercorns. Firstly hard boil the eggs, peel and set aside to cool. While they are cooling add the vinegar and spices to a pan and bring to the boil, but as it starts to bubble turn off and set aside for 2 hours. Fill the jar with the hard boil eggs, sieve the vinegar mixture and pour over the eggs. Tightly screw on the jar lid. Best to set aside for 1 month for flavours to mix, you can store these for 6-8 months and are delicious with a salad, chunky chips or even a pint of beer. Pickled Onions: What You Need: Pickling Onions (enough to fill the jar you are using), 1tsp Crushed Chillies, 1stp whole Cloves, 1tsp Whole Allspice, 1tsp Black Peppercorns, Garlic Clove, Salt. First peel the onions and wash, place in a large bowl and cover with water (enought to cover the onions). Sprinke around 75g of salt over the onions, cover the bowl with a cloth and set around for 24 hours. Next day prepare the vingaer mixture like the eggs, fill the jar with onions and pour over the vingar. Seal and store for up to 12 months. A perfect christmas, and why not try the same with beetroot and red cabbage.